Barcel Takis Fuego are mini corn tortilla chips that are rolled up like a small taco. Takis Fuego are made from corn, palm oil, seasoning that includes salt sugar, natural flavors, citric acid, soy protein, yeast extract, monosodium glutamate, maltodextrin, dodium diacetate, vegetal oil, artificial flavors, onion powder, chili extract, silicate dioxide, baking soda, 2% or less of antioxidants and traces of lime. 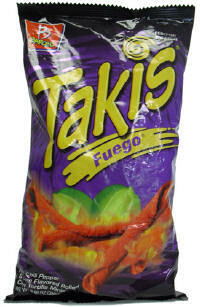 These Takis Fuego are made in Mexico and imported/distribuited by Barcel USA LLC.